These are my new fused and slumped lamps. Many more on the way! Each panel is two layers thick and measures 8.5" x 8.5" and rests on a painted ceramic base that houses the bulb. Stunning and unique and sure to grace any home. A perfect lamp to set the mood! 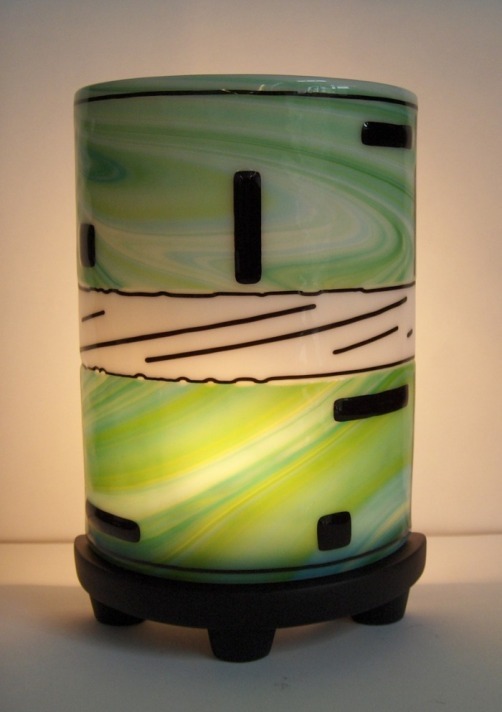 This lamp is black and white with irid white center with black and red glass stringer accents. Swirling green hues with black accents. The client loves the Catalina 34 sailboat. Blue and white hues of the water also give the reflection of the sails on the water. The swirling black sky adds intensity of impending storm.